CSI’s 2017 Class of Fellows. The 2018 class will be honored during CONSTRUCT in October. 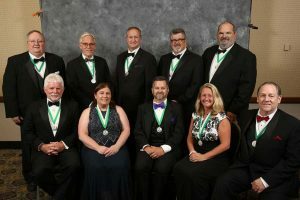 CSI has announced the organization’s award winners for 2018, as well as those elevated to the College of Fellows and those named Distinguished Members. The Institute’s honors and awards program recognizes talent, achievements, and notable contributions to the construction industry by members, in support of the mission of CSI. Recipients will be recognized during the CSI honors and awards ceremony at CONSTRUCT 2018 in Long Beach, California, on October 4. Joining the ranks of Distinguished Members are Gregory J. Markling, FCSI, Lifetime Member, CSC, CCS, CCCA, and Robert W. Simmons, FCSI, Lifetime Member, CCPR. “Distinguished Service” is defined as notable and significant contributions at the Chapter, Region, or Institute level furthering the mission of CSI, its standing in the industry, or its image to the public. This year’s Distinguished Service Award will be presented to Daniel Hargreaves, FCSI, CDT. The Robert P. Brosseau Award for the Advancement of CSI recognizes members who have been recognized by peers as leaders focused on education, and the training and mentoring of students and emerging professionals. It will be presented to Shane David, CSI, CDT. Sheryl Dodd-Hansen, FCSI, CCS, CCCA, and Kurt Moehlmann, CSI, CDT, share the Andrew J. Drozda Mentorship award. This award is presented to a CSI member recognized by their peers as a true mentor, one who espouses leading by example, and is one who is considered a primary support pillar from whom others can draw strength. CSI Chicago’s Contractor Engagement Committee will be presented with the Norman Hunter Award for Innovative Allied Organization Cooperation. This award is presented in recognition of bringing multiple construction organizations together for a single goal or event. On the communications front, Robert Haddock, CSI, is the winner of the Ben John Small Technical Writing Award. The Specifier Article of the Year Award for an original article published in The Construction Specifier magazine goes to Wendy Talarico, CSI, and Frederick C. Baumert, CCS, for their article, “Building in Tight Urban Spaces,” in the August 2017 issue. For commendable contributions that further the influence of CSI, or increase its visibility, in the local construction industry, or that provide a value-added service to the organization, Laura Jean Derrick, CSI, will receive the Outstanding Contribution Award. Derrick is a member of the CSI South East Region, Training Leadership Committee. Organizational Certificates of Appreciation will be presented to Associated Builders and Contractors (ABC), Eastern Pennsylvania, and Hispanic American Construction Industry Association (HACIA). CSI is a national association of more than 8000 volunteers, including specifiers, architects, engineers, contractors, facility managers, product representatives, manufacturers, owners, and others who are experts in building construction and the materials used therein.